This is the home of our dear friends and clients who allowed us to fully create our vision. We have designed several of there homes. 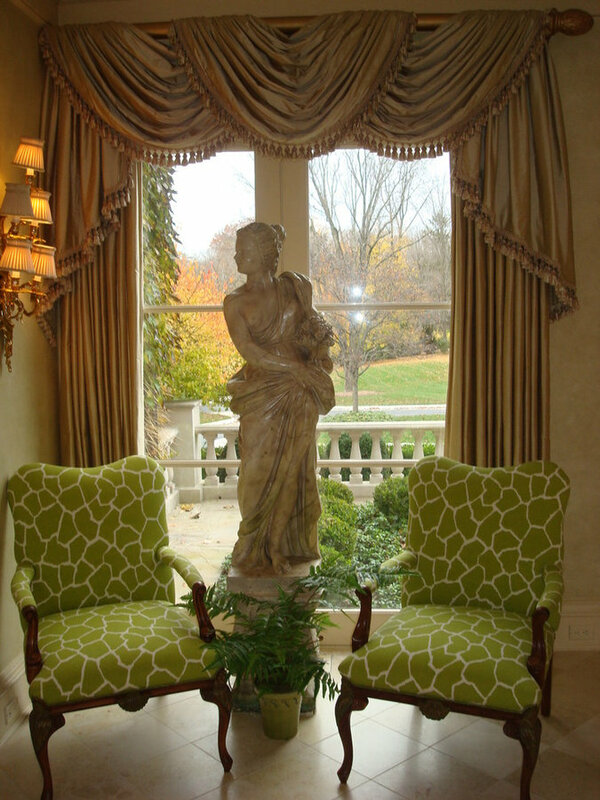 One side of the foyer uses a lime green giraffe print and the other a fuscia on a pair of french bergere chairs. 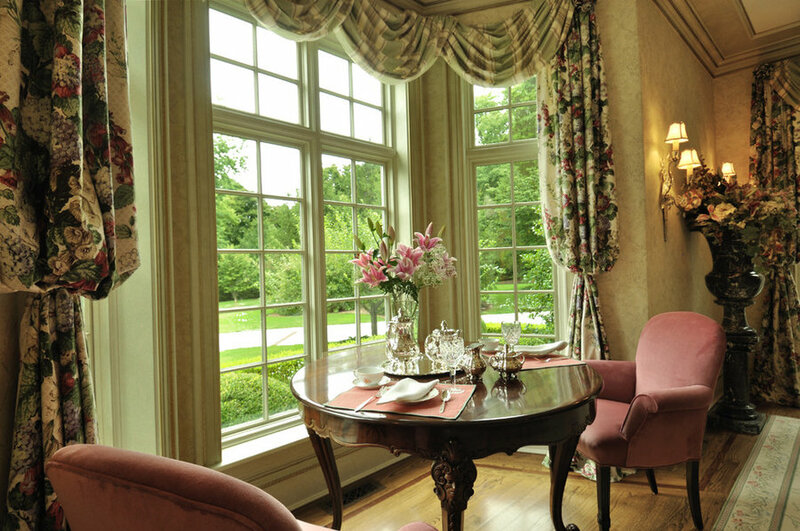 The window is framed using swags and jabots with operable side panels in a creamy taupe color. The walls are fauxed. 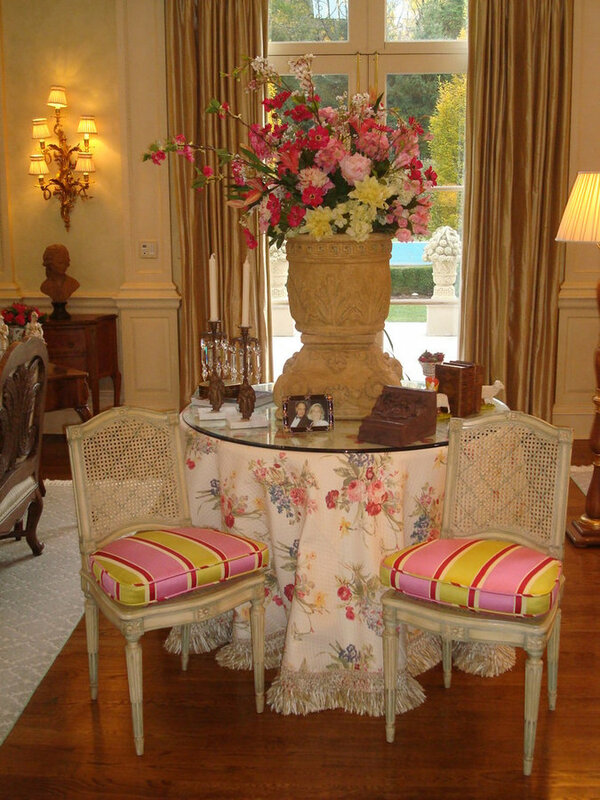 One side of the foyer uses a lime green giraffe print and the other a fuscia on a pair of french bergere chairs. 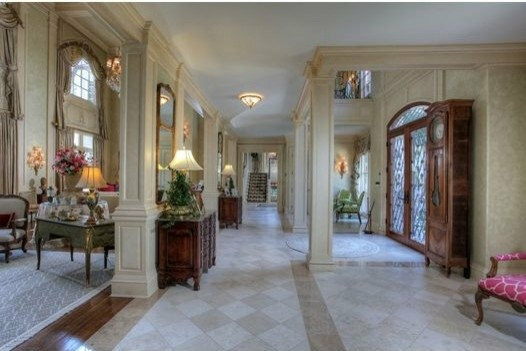 The entrance hall to this foyer has 10 foot high ceilings. The entrance door is in the center of the space so we flanked the door with a pair of matching conversation areas as seen in the other photos. It opens up into the dramatic two story living room. In this view you get an opportunity to see the overall room in its entirity. 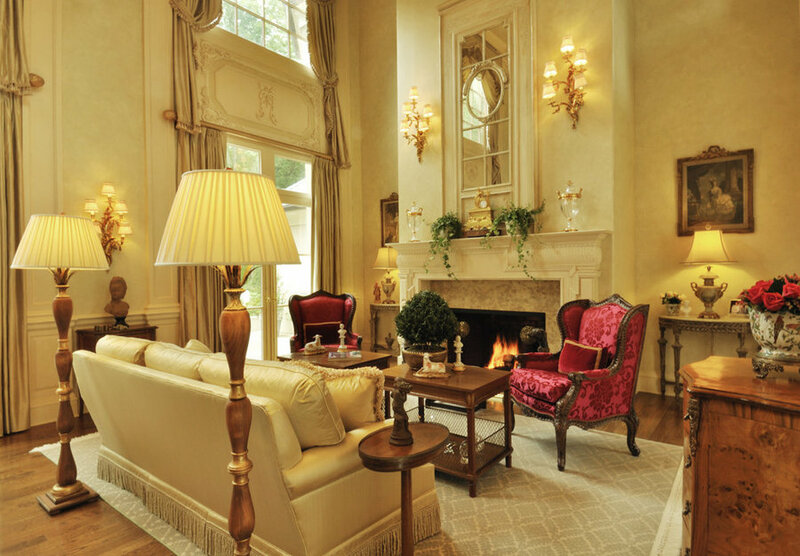 The living room, allows you to see the silk damask wing chairs flanking the marble fireplace. 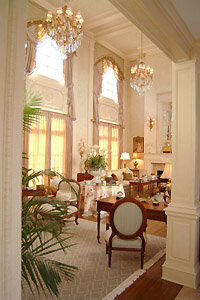 In the area between the French doors and the transoms, we embleshwd the void with decorative moldings. The trumeau is still the feature over the fireplace of this room. 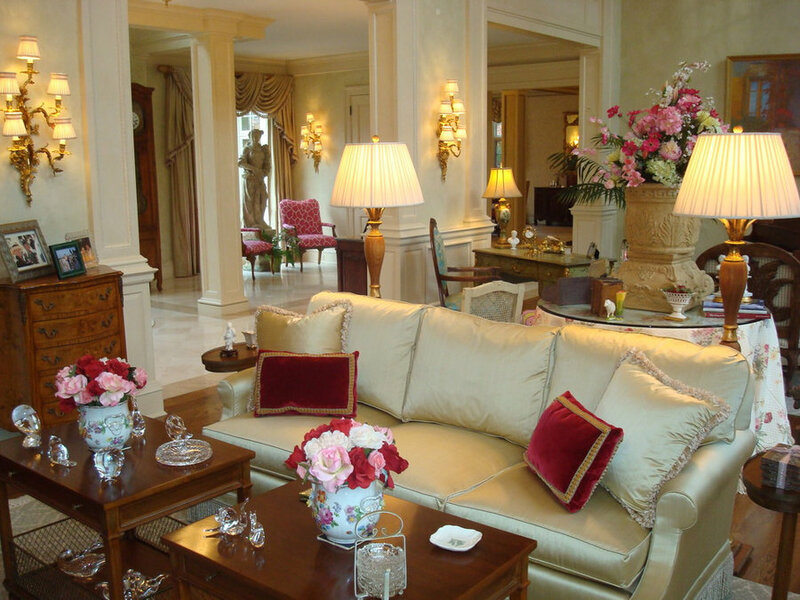 In the formal living room, we chose to create a neutral back drop, but introduced pops of color. The silk sofa is done in gold with a pop of magneta as pillows. 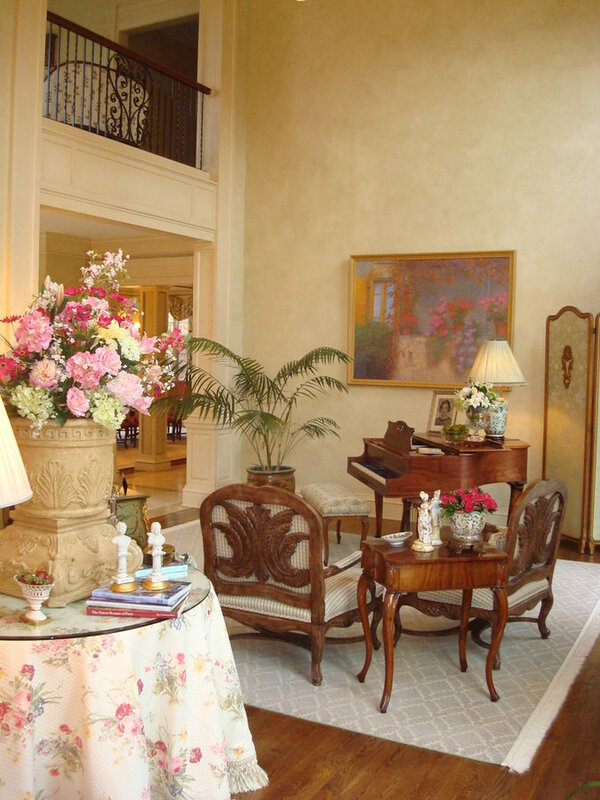 The colors are drawn from the clients favorite painting located in this room at the far wall. 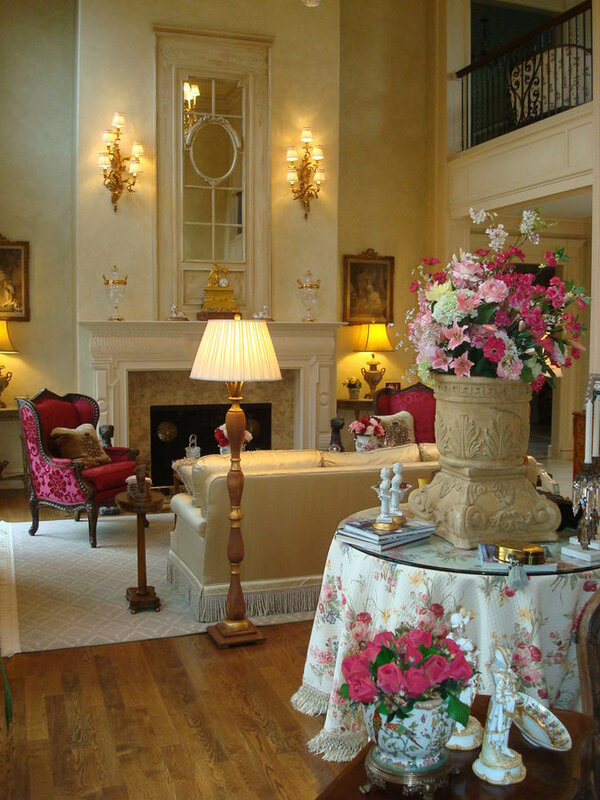 The five tier sconces were a find and adds addtional drama to the two story height of the room. 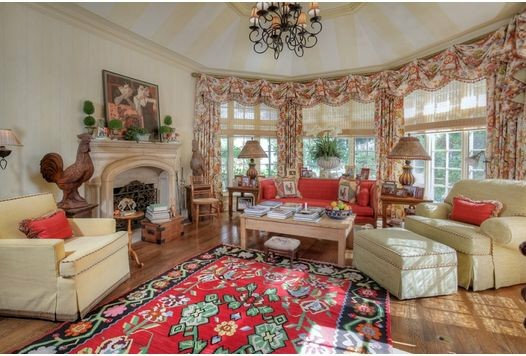 We seperated the two conversation areas in the living room with a center table which we skirted in a quilted floral fabric. The pair of caned chairs have been reupholstered introducing color. Placing a pair of chairs with a carved wood back around the families brings interest in the room. Our clients favorite painting is the inspiraton for the room. Over the mantel, we designed a trumeau which was actually a French door which we embleshed to work in the room. The gold silk sofa creates the conversation area around the fireplace, which is flanked by a pair of magneta damak patterned wing chairs. In the foreground, is the skirted table, with floral arrangement designed by us. 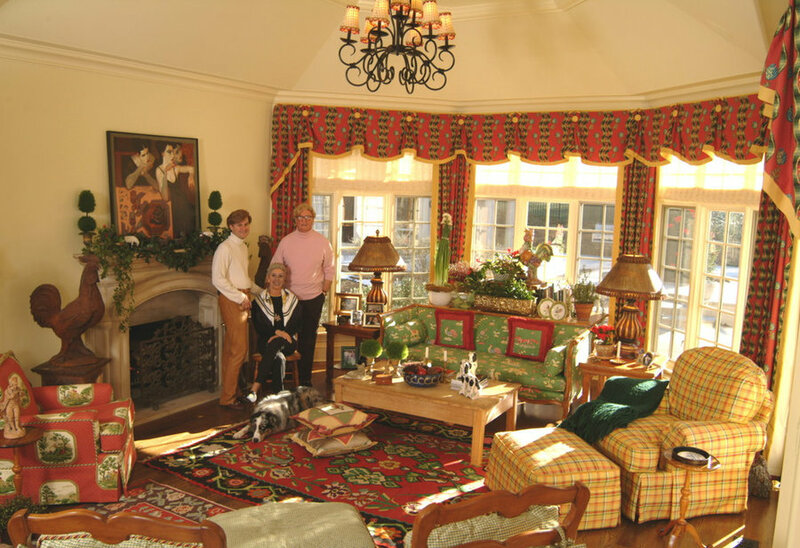 In the formal living room, , we chose to create a neutral back drop, but introduced pops of color. The five tier sconces were a find and adds addtional drama to the two story height of the room. As the room is large we created two conversation area - a music area with writing desk and an area around the fireplace. This image displays the two story gallery and the formal living room, which opens to the foyer, we chose to create a neutral back drop, but introduced pops of color. 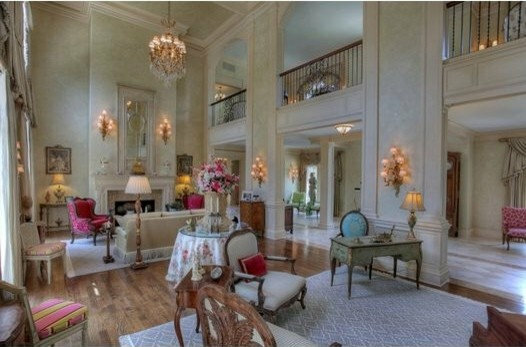 The five tier sconces and chandeliers adds addtional drama to the two story height of the room. 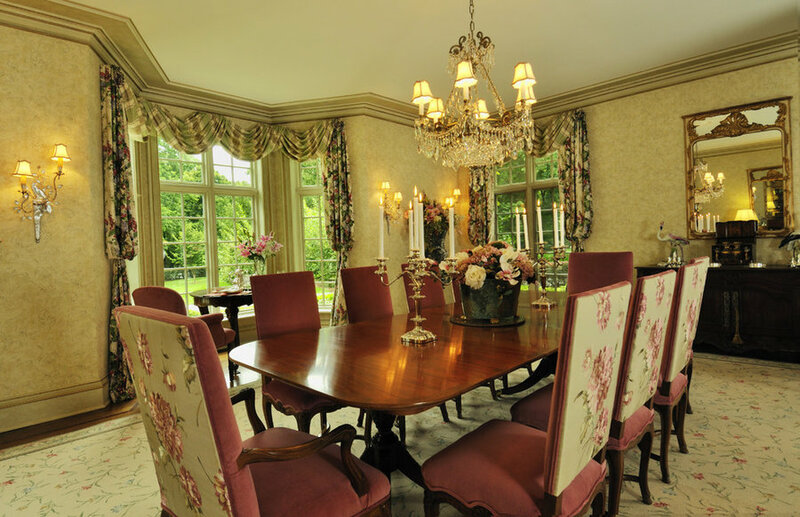 The intimate dining area, part of the formal dining room is papered in a muted trellis paper in green and cream. We choose to highlight the ceiling by painting it in tinted paint with a shade of green. For the window treatments we chose to use a large scale floral fabric for the bishop sleeves and a silk stripe for the swags. 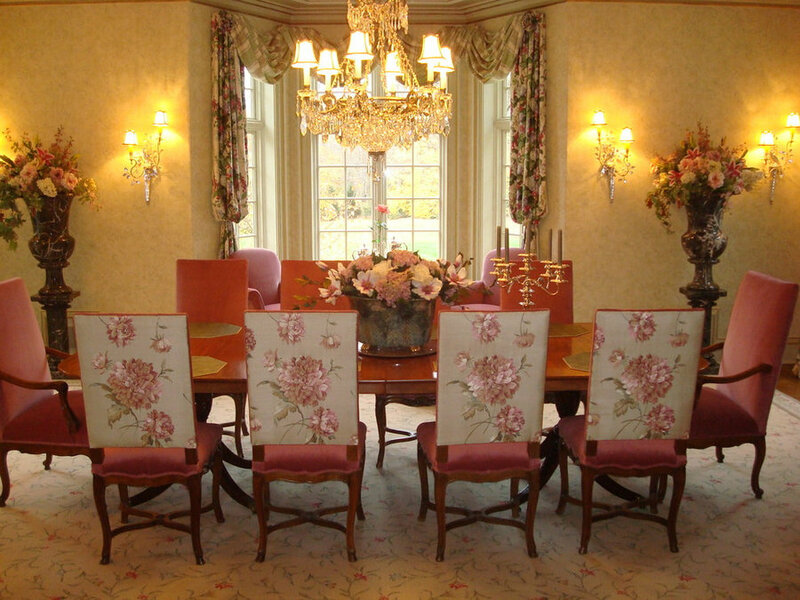 The dining room was designed with two seating area's. One for formal entertaining and one for intimate dining. The dining room is papered in a muted trellis paper in green and cream. 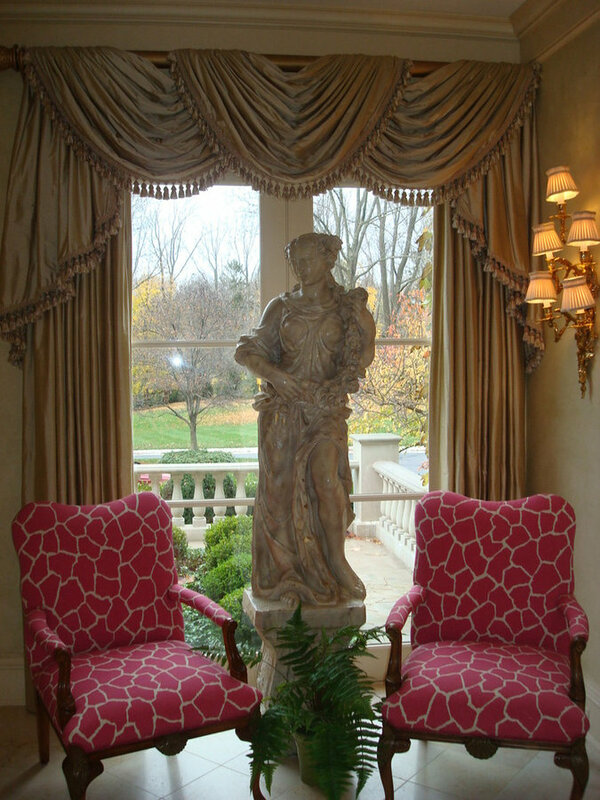 Flanking the bay window are a pair of crystal bird sconces with a pair of marble urns. Over top of the dining table hangs a Russian Crystal chandeleir. For the window treatments we chose to use a large scale floral fabric for the bishop sleeves and a silk stripe for the swags. The French antique dining chairs are upholstered in a two different fabrics. At either end of the table is an antique French server, with an antique Trumeau overtop. The workinig part of the kitchen was created with many carved details. At the island, we set a pair of rooster lamps. 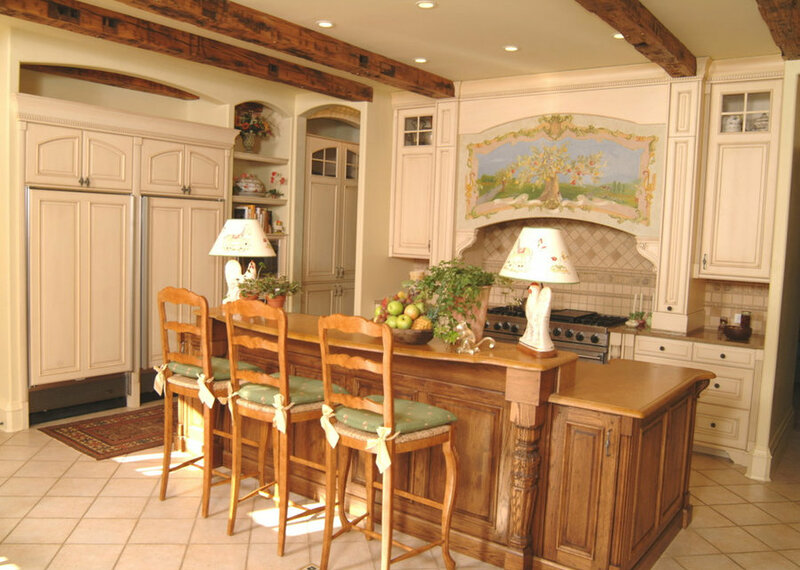 The island was stained to stand out from the rest of the antiqued cream cabinetry. Overtop of the stove hood, we had our artist paint a French landscape to make the hood sings. We enhanced the ceiling by installing reclaimed wood beams from a barn. 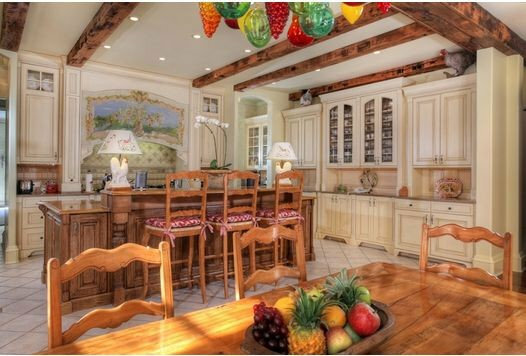 The kitchen island was electrifiedto install a pair of antique rooster lamps with decopaged shades. Over the stove hood we painted a French landscape with the house in the back ground. In the foreground is the breakfast room where we hung a hand blown chandelier with hand blown fruit. The island was stained to break up the cream cabinets . The rugs are indian and mexican inspired which were found during our travels. The French sofa was reupholstered using a fabric with a bold green background. A fully uphostered yellow plaid chair is our clients favorite. 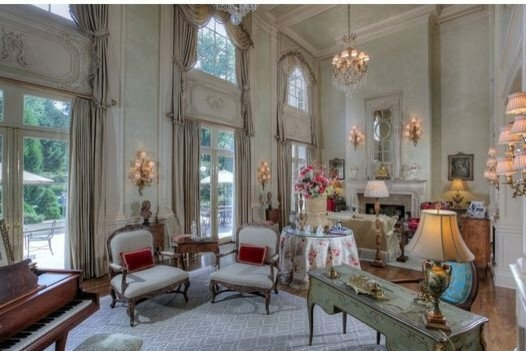 To the far left is a chair covered in a fabric with French scenes. The drapery is a scalloped valance and added a yellow banding to it to add drama. The redone Great room is brighter by striping the tray ceiling so that it brings even more height to the room. The drapery background is cream and it has a floral pattern. The pastel colors from the rug werer drawn out - the yellow, green and the red sofa. Here is another view of the master bedroom. We creatte a conversation area using beautiful antique french chairs we found in Palm Beach and then had them reupholstered using this beautiful tulip fabric. The drapery is a small print in greens, mustards and creams. Enjoy! Every child should have such a fun room. This room is a fun escape from the every day for a child. It is in the home of our dear friends and clients. Love how it turned out! It has an area for mommy reading time. the boat is the actual bed. We used real life preservers adn bouys for the the accessories to give it a real beachy feel the paneling is fauxed to look like driftwood. 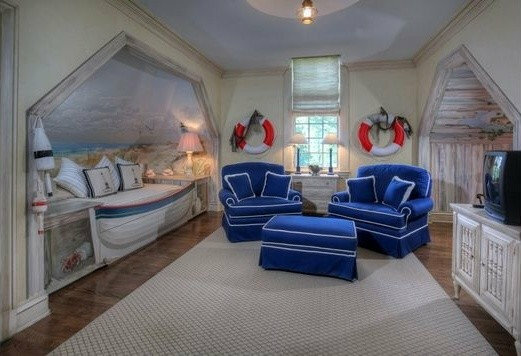 The front of the bed is fauxed to look like a boat. The faux artist was amazing! 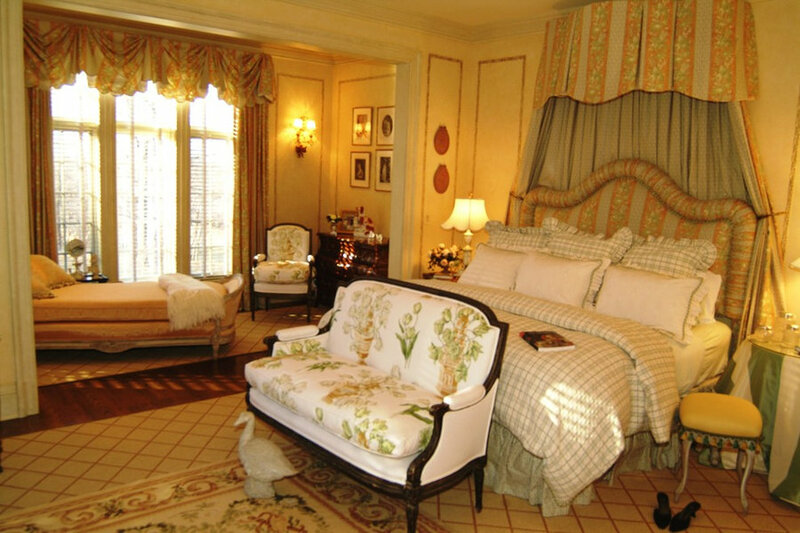 In this bedroom, we used a number of patterns. The main fabric is a branch and twig medailion design. Inside the medalion is a floral bouquet in coral and rose. We papered the room using a sawn wood look. On the back cushions on the sitting area, we used a brush fringe on the quilted fabric. 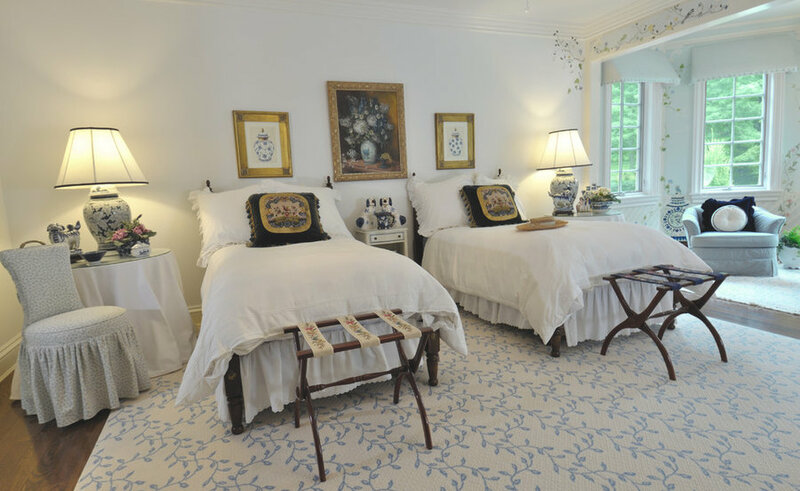 In this Guest Bedroom, we kept it chic and elegant. A pair of twin beds, in crisp white linens, and bedding make the room very inviting. 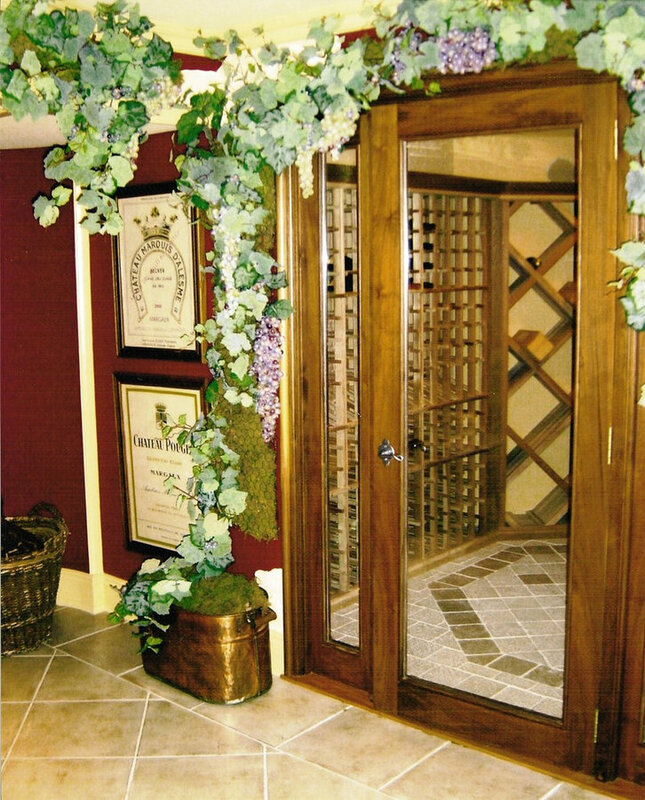 We introduced a vine like wilton rug as the base to the room. In the bay window area, we had our artist paint vines birds and delft urns. The seating area has a pair of pale blue chairs. On the pair of skirted tables we introduce a pair of blue delft lamps. Enjoy! 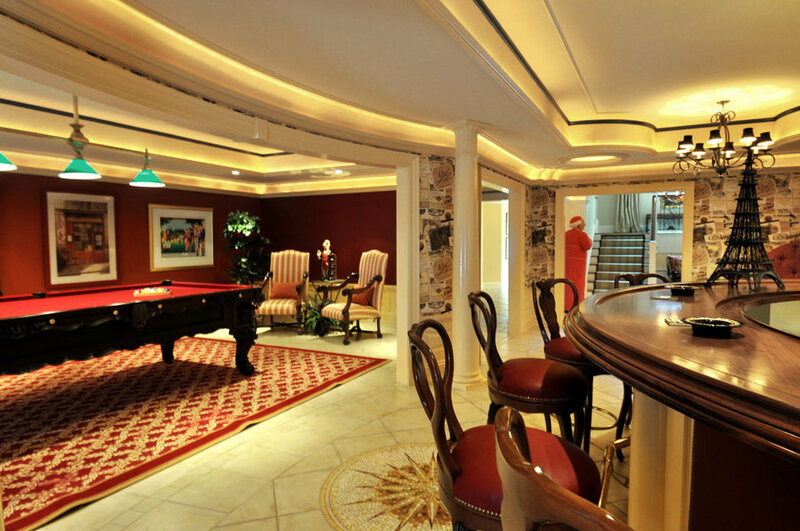 In this view gives you the opportunity to view the billard table area just off of the bar. We chose to paint these walls in a burgundy color and pop the accent color of teal in the upper molding. The bar in the foreground, has a wood top and we chose to paint it rather than keep it wood. A mosaic medalion is placed at the center of the bar floor. 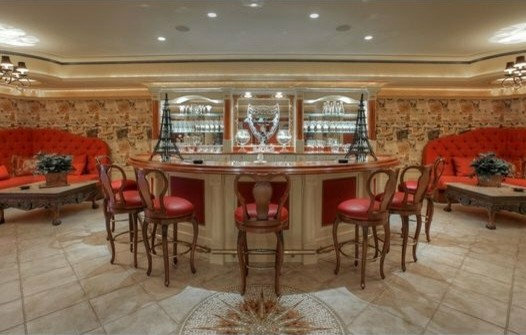 On either side of the bar, we created a pair of conversation areas in the form of a banquet, using burgundy and gold quilted fabric. Over top hangs and metal chandelier. 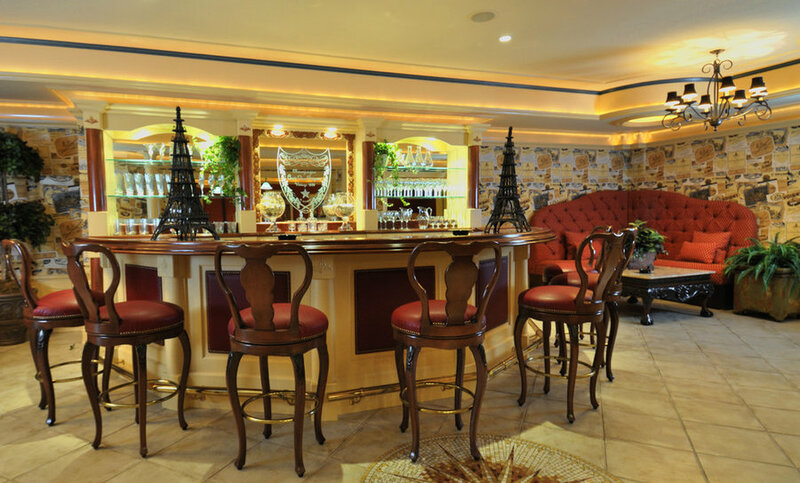 The bar in the foreground, has a wood top and we chose to paint it rather than keep it wood. This made the lower level much brighter. 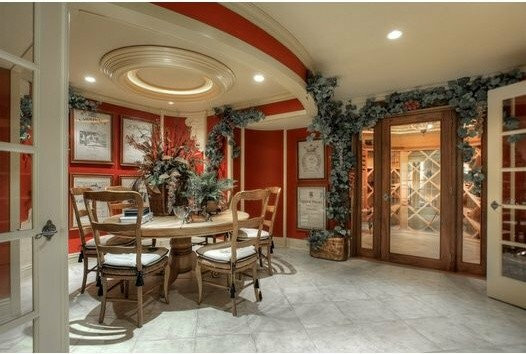 In this wine tasting area just outside the wine cellar we made it a dual purpose area. We can also use this a a game table for the guys to play cards. For the seat cushions and artwork, we found some vintage dish towels and used the as art and for the seat cushions. Think out of the box and you too can be original! Over top of the game table is a circular coffer highlighted with rope lighting.